Landscape photography workshop in Valle d'Aosta, Italy. 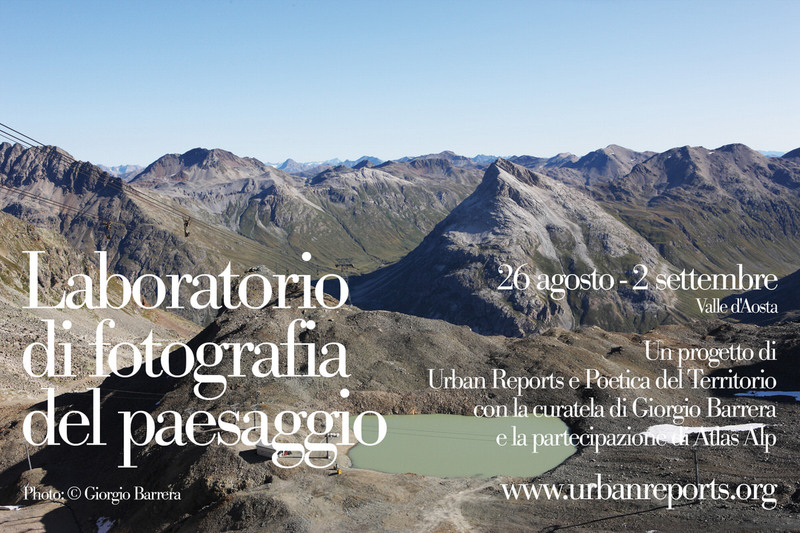 This summer, between Aug 26th and Sept the 2nd, Urban Reports, together with the Association Poetica del Territorio and the curatorship of Giorgio Barrera, organize a series of landscape photography sessions in Valle d’Aosta, Italy. The aim of the workshop is to foster a cross-disciplinary reflection on the role of photography as a tool to provide new visual perspectives on contemporary landscapes and to create a series of photographic projects that can produce a new territorial narrative. Photographers (both amateur and professionals) will work together for a collective reflection on the landscape transformations that have shaped this territory throughout the last four decades. 1-2 September: public presentation of the collective work followed by a multidisciplinary debate session. Guided by local experts, and through the interaction with the communities, the workshop will propose the use of photography as an explorative document, a language and visual tool of a territorial identity and a unique landscape. The workshop is curated by Giorgio Barrera and conducted by the collective Urban Reports, with the methodological contribution of Atlas Alp represented by the photographers Andrea Botto and Laura Cantarella. The project is supported by the the municipalities of Saint-Vincent and Torgnon.